Daffodils are out! At least at our local grocery store. There's nothing that makes the dining room brighter than a dozen are so smiling daffodils. We spend a lot of time in our dining room. We enjoy our meals there of course. Since we expanded the table, we've also been using it for many other pursuits. The large flat workspace has proven great for sewing projects, wrapping gifts, sorting through piles of paper in preparing our taxes, and Mike even used it recently to assemble a poster for a work conference. The babies gaze up at the chandelier as if it were a large mobile. When their interest begins to wane, we adjust the dimmer which creates different sparkles and hues. With all that gazing, I've had to put 'dust and clean chandelier' on my to do list. Happy daffodils (even the grocery store variety) to you! Gorgeous and very inspiring, I may just have to try it for myself. the first daffodils in our garden are out! every end of february i am so grateful to live in ireland and to have a huge garden. in most parts of europe there is still snow or at least grey landscapes. 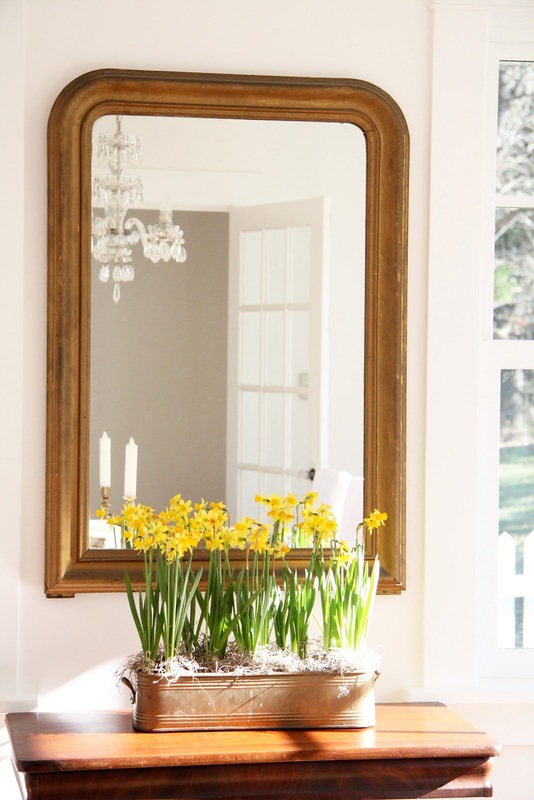 it is so nice to welcome early spring with some daffodils inside the house too. your dining room looks soooo bright, beautiful. Lovely. I would love to know more about that container. I'm sure the beautiful bright yellow daffodils will catch the babies attention as well. Store bought or garden grown, I welcome all flowers into my home! Sweet! So springy and bright. It makes me happy to see your daffodils, and hear about your family dinners. Have a great day! Happy daffodils to you to! After a long cold winter, the sight of the daffs, even in the supermarket, is uplifting. Love the shot of the room where you can see the picket fence outside. So sweet! I am so thrilled so hear that you found daffodils at the store! March 1st and daffodils.....happiness! Your dining room is lovely, simple and fresh....I adore it. It really is almost Spring - beautiful daffodils. Mine are popping up in the yard getting ready to bloom in a couple of weeks! Your daffodils are beautiful, as well as the rest of your farmhouse!! What a beautiful way to announce Spring into your home! I've been eyeing the bulb flowers at our local grocery too but never like the way they have them arranged in those tacky bright aluminum wrappers. I like how you've given yours a new home in that lovely pot. Just beautiful! We have had so much snow and ice here in Michigan that your post was a breath of fresh air!!!! And today I THINK spring came to Norway!! It's dripping from the roof for the first time this year. We have ski World Championship in Oslo now, and a lot of snow. And we need it for that, of course. But just after that, I would like it to disappear. For quite a few months!!! Thank you for the glimpse of Spring and the update about your dear family. I loved hearing about your wee ones and their fascination with the chandelier. My oldest grandson did the same when they visited - his incredible involvement with the chandelier always amazed me. It served to keep him happy many times! Happy Daffodils to you, Trina. Your dining room is gorgeous. There is nothing more cheerful that a little splash of yellow this time of year. Bring on Spring! Sounds like the perfect way to have dinner. I am jealous as mine are grown. Just waiting ever so patiently for grandchildren. The daffodils are the first sign of spring around NC...the budding bradford pear trees will be next. It makes me giddy! It is amazing...a week ago we were in the dead of winter, and now everything is blooming already-the cherry trees, the dogwoods, the forsythia, the daffodils and tulips! Sure hope we don't get another cold snap. The daffodils are here in Oregon too! And so are the hyacinth. They were three for $10 at Safeway so of course I had to bring some home. Enjoy your daffodils. They look perfectly at home in your beautiful, sunshine-filled dining room. Love that imagery of the babies looking up at a dimmed chandelier with sparkling crystals dancing on the walls. I can almost see it. I love your blog. It is calming. I can't believe I'm finally the first one to comment you usually have 3 billion comments. I have, if I'm lucky 3. Hee Hee. gorgeous and of course the lovely container you have them in helps!! Okay, I'm so envious of these bloggers and the flowers that are blooming. As I look out my window we are at least ankle deep in snow still! :( Blogging from the Midwest! Nothing says spring like daffodil blossoms :) I love the pop of yellow! Ahh...spring flowers, we are knee deep in snow here in the rockies...I miss the Oregon Coast and the mild winters. Enjoy the green. Daffodils just say March to me and very apt for St David's day as the national flower of Wales. Beautiful dining room, so lovely that you use it all the time. It's so gorgeous! I love daffodils! I bought some at the grocery store too. They are my favorite flower, can't get enough of Spring time flowers. I love the container you have them in, just lovely. What a fun mental image of you have dinner with two babies in bouncy seats on the table! We use to do that too, but only one at a time! Love that you are a mommy! is it hard to keep them alive inside like that? 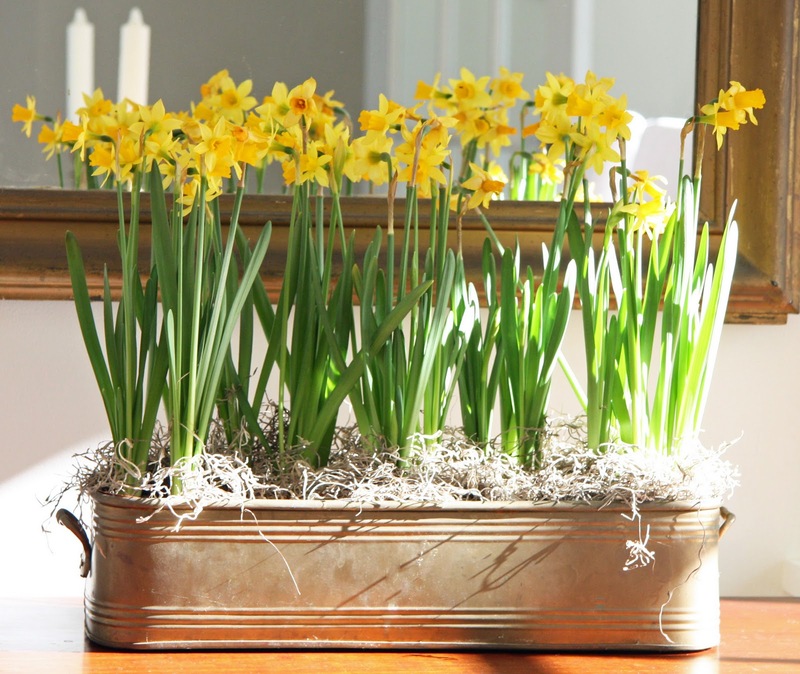 Loving the daffodils... need to bring some of the smiling sunshine into our home. Where is all your clutter? Where the camera doesn't see? Yes, I need daffodils, sunshine, and less clutter....LOL. Love your dining room; with the sun shining, the green grass, and the white picket fence it looks like Spring...must be the daffodils. What a lovely image to think of your two gazing up at that chandelier! When my twins were babies, we did bouncy chairs on the dining room table too. Then graduated to Bumbos. Of course that stopped with they learned to tip back in them. Daffodils are so sunny and happy. Daffodils are such happy flowers - I love tulips too. I'm so ready for Spring! LOVE your table! I agree with you - I love the way they brighten up a room! I feel the same way about tulips. I have some pink ones on my kitchen table right now! Trina, the daffodils are so cheery and happy. If I were Graham or Margaret, I'd be staring at them...after being dazzled by the chandelier of course! Your dining room is so lovely...the windows and the sunshine were worth every piece of blue tape used to create it! In fact, I just posted about my Daffs today. They're absolutely beautiful. Confession: I've never really liked daffodils because they're just too 'easy' to grow -- like it takes not skill at all. Is that horrible?! Daffodils, one of my favorite Spring flowers and yours look so nice in your dining room. My garden is bursting, you'd love it. Please come visit...my recent post shows a few Spring beauties. Oh the daffodils are so pretty. They always let you know that Spring is almost here. yes, nothings is brighter in spring than Daffodils. They are so wonderful blooming and smelling, too. Your house looks perfect. So very inviting and I can imagine how nice it is to have such a big table. 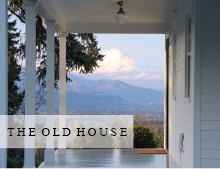 Really the heart of the house.I came from Kathy @ A Delightsome Life and I am a new follower to your blog. Got here from A Delightsome Life, via Kathy... and am following your blog now. Lovely home you acquired and the daffodils really do brighten an early spring day. We have them outside in different Heirloom varieties; all fragrant ones and we do bring them inside. I love that sunny dining room! The daffodils are just perfect, especially at this time of year. "The babies gaze up at the chandelier as if it were a large mobile." I love that! Did you ever see the Waterford ad with the little girl next to the crystal bowl. It spoke of teaching children to appreciate beautiful things from the very beginning. ps Congratulations on your Flea Market Style mention! SO gorgeous! I am still waiting on spring! 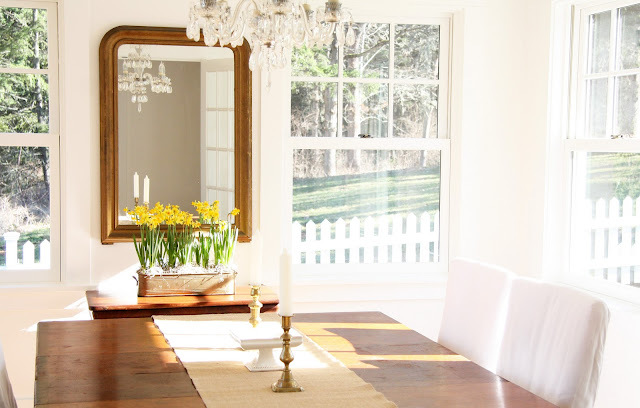 The daffodils seem right at home in your dining room! We have daffodils popping up all over the yard, and it's our first spring in our home, so I have no idea what has been planted over the years. Fun suprises! I love the simplicity of your decor. The touch of yellow is beautiful in there. WOW, great minds think alike!! Thank you SO MUCH for the inspiration... I can only hope to be able to pull mine together so well! Well you have certainly inspired me to pull my seldom used copper fish poacher down from my rack and fill it with springtime instead. Always so nice to stop by. Honestly I would love to nibble on those little piggies above! I always love my first glimpse of daffodils each spring! Last year, before we tore the house down on our lot, we were thrilled to discover that there were literally dozens of daffodils on the property. We picked them for a few weeks, and our house was so sunny and yellow! I love your copper pot of daffodils. They also add such a great touch of spring to any room. I love the mini daffodils! And every night when one of us sits down to dinner while the other holds the baby, I think, "one day we will eat dinner in the dining room again ..." ha.